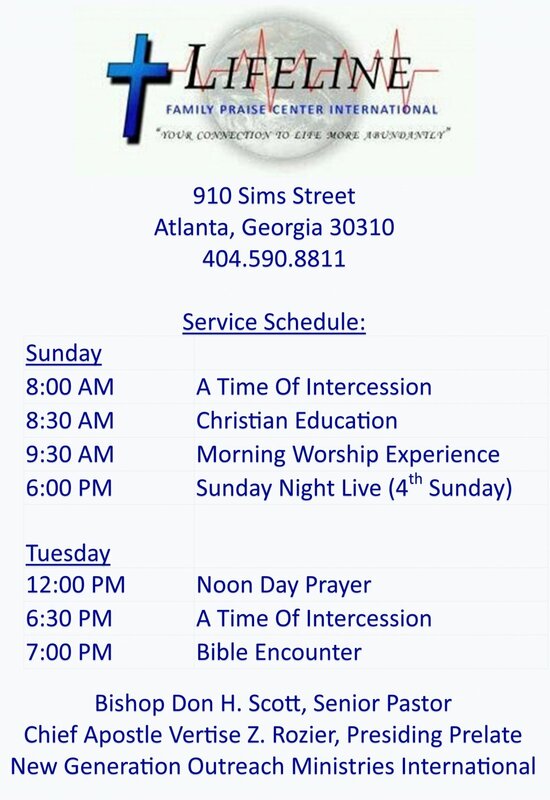 Welcome to LifeLine Family Praise Center International, a thriving, SPIRIT Filled church located in the Pittsburg Community of Atlanta at 910 Sims Street. LifeLine offers worshipers a loving environment in which to connect with others through an array of youth programs, community events and services which cater to your individual need as well as the fortification of your family. Everyone is invited to experience LifeLine, "Your connection to Life More abundantly!". LifeLine's services are filled with the SPIRIT of THE LORD and produce an environment conducive to gaining a deeper intimacy with our LORD and SAVIOR, JESUS CHRIST. By understanding we are disciples of the Lord, we seek to be instruments of God's transforming hand in this world. We help followers of the faith to deepen their understanding while connecting communities together under one roof. Come worship with us and experience a Love like you have never felt before.